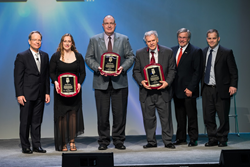 SAE International Honors a Team of Motorsports Safety Professionals in 2018 with the 2017 John Melvin Motorsports Safety Award. This award honors individuals, organizations or teams (both SAE members and non-members) whose research and/or practical application represents unique, original concepts that cause significant positive change and elevate safety to new levels of innovation, in the memory of Dr. John Melvin. Established in 2016, this award honors individuals, organizations or teams (both SAE members and non-members) whose research and/or practical application represents unique, original concepts that, when applied to motorsports, cause significant positive change and elevate safety to new levels of innovation, in the memory of Dr. John Melvin. With funding from the Indianapolis Motor Speedway, the Indy Racing League, and NASCAR, this team of specialists designed, developed, and crash tested the Steel and Foam Energy Reduction Barrier (SAFER Barrier). The SAFER Barrier is a technology found on oval automobile race tracks and high-speed sections of road and street courses, absorbs and reduces kinetic energy during the impact of a high-speed crash, and thus, lessen injuries sustained to drivers and spectators. Since the installation of the SAFER Barrier, there have been no driver fatalities in NASCAR or lndyCar events resulting from errant racecars hitting a retaining wall at a track where the SAFER Barrier was installed. The barrier design and development was led by Dean Sicking and the team from the Midwest Roadside Safety Facility at the University of Nebraska-Lincoln. The initial funding for the research came from Tony George of the Indy Racing League (IRL) and the Indianapolis Motor Speedway (IMS).